As a Certified Quilt Instructor and Certified Zentangle Teacher (CZT), the mingling of pattern and quilting go hand in hand. Please see my website www.thestitchinrn..com for classes offered and find out where I will be teaching. For Christmas table.... I want to make this table runner in some very shiny fabrics- but I didn't want to practice the 'how-to' on the fabrics, so I made it out of my stash fabrics, and now after I bind it, I can use it at Christmas. 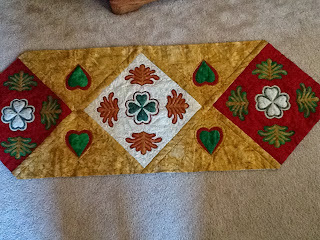 The hearts and the 4 leaf hearts are done as in a trapunto technique. All but the putting of parts together were done in the embroidery hoop on my Bernina 830. (I love that machine when it behaves so nicely). I will be teaching this method in November.